With two high-end race bikes, the Foil and Addict, the gap to the next-in-line ‘enthusiasts’ CR1 was noticeably large, or at least it was. The full-carbon Solace has just been launched, squarely aimed at plugging the gap with its ‘Endurance Road’ title. 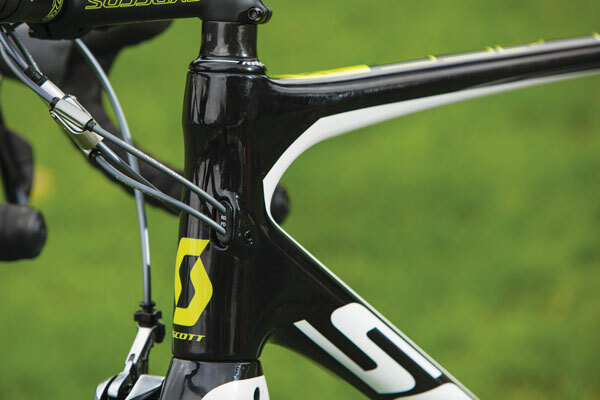 The new bike is said to share the CR1’s geometry, but Scott claims to have increased comfort and stiffness. While this may sound like a contradiction in terms, the Swiss firm says it has achieved this by splitting the design into two predominant diagonal sections. The upper section, top tube, seatstay and seat tube attend to comfort, while the chainstay, down and head tubes and upper fork see to stiffness. To achieve the comfort elements, the seatstays meet with the seat tube much lower down than the CR1’s and cross over diagonally to the top tube. Skirting the seat tube also means the chainstays are a touch wider apart at 53mm. Locating the rear brake beneath the chainstays has enabled Scott to use a much softer tube shape and lay-up as braking forces don’t need to be accounted for. Integrated bearings and the same headset as the Addict, along with a tapered head tube (1 1/8in to 1 1/4in) assists with front-end stiffness. 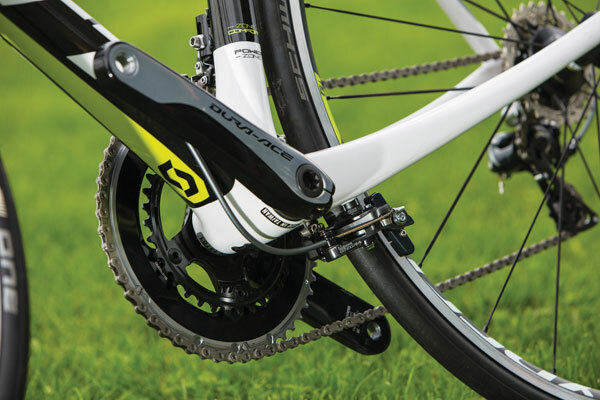 The hollow chassis of the bottom bracket area is beefy – in fact it’s 25 per cent wider than the CR1’s. Asymmetric chain and seatstays also assist in improving the pedal-to-wheel power transfer. 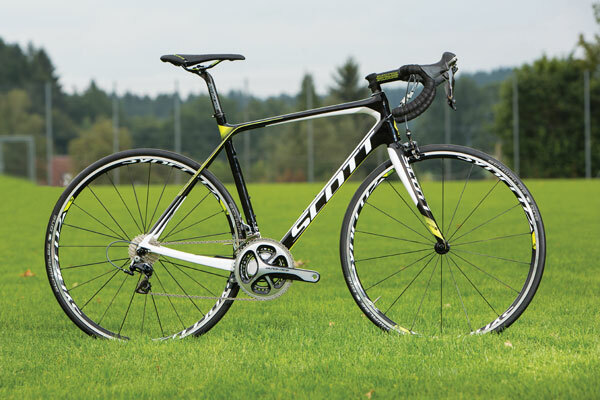 Scott says the end result is a bike that’s 42 per cent more comfortable than the CR1 with a bottom bracket stiffness increase of 17 per cent and a lateral stiffness increase of three per cent for a combined frame and fork weight of 1,220g. Prices start from £1,999 for the 105-equipped Solace 30. With 10 versions and seven sizes available in the standard range and five in the women’s-specific Contessa, there should be something to suit everyone. Scott believes that there’s more to creating different frame sizes than just scaling tubes up or down. Larger bikes get beefed-up tubing by up to 3mm and a reinforced head tube. Smaller sizes gain a softer carbon lay-up in order to enhance comfort for lighter riders, while larger riders benefit from a stiffer down tube to maintain rigidity. A women’s specific Contessa with a 10mm higher front end is also available.